Collège Boréal is subject to the Freedom of Information and Protection of Privacy Act. Please refer to the following notices in our website: “Notice to college students on the disclosure of student enrolment data to the MTCU” and “Notice of disclosure of personal information to Statistics Canada”. 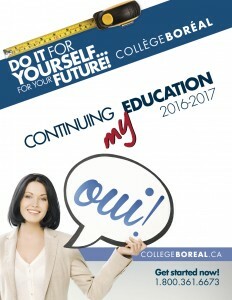 If you have any questions regarding the confidentiality of your personal information at Collège Boréal, please contact the Registrar at registrariat@collegeboreal.ca or 1.800.361.6673. Canada’s new anti-spam legislation (also known as CASL) came into effect on July 1st , 2014. CASL aims to reduce the number of unsolicited emails that appear in consumers’ inboxes by requiring that businesses obtain the consumer’s consent before sending commercial electronic messages. CASL protects consumers and businesses against the most damaging and deceptive forms of spam and other hazards related to electronic messages in Canada. CASL prohibits the sending of commercial electronic messages without the recipient’s expressed or implied consent, including messages sent to email addresses and text messages sent to a cell phone. CASL prohibits the use of false or misleading representations to promote products, services or business interests in electronic messages. CASL prohibits the collection of personal information by accessing a computer system in violation of federal law (e.g. the Criminal Code of Canada). CASL prohibits the collection of electronic addresses through the use of computer programs or the use of such addresses, without permission (a practice known as address harvesting). Collège Boréal has implemented measures which aim to ensure that its electronic communication practices comply with CASL regulations. These measures include: obtaining your consent prior to sending you commercial electronic messages (CEM); ensuring that a method to unsubscribe from CEMs is provided when necessary; and responding to unsubscribe requests in a timely manner. For more information on CASL, please visit www.fightspam.gc.ca.